Céad Míle Fáilte! a hundred thousand welcomes! to parishioners and friends to our parish website. We hope you will enjoy navigating around on the web pages and that you find the information here interesting and informative. In 2010, we celebrated the joyous milestone of being 200 years old! The first SS. Peter & Paul’s church was built in 1810 when there was one parish in Clonmel: St. Mary’s, Irishtown. We remembered and saluted, through various events, the great people of the generations past who left us something wonderful to celebrate, those who stayed at home and those who had to emigrate to far off lands, proud of faith and fatherland. We thank God for our parishioners today who recently renovated Ss. Peter & Pauls church for future generations. We place our future in His hands for a new springtime in our Church. My colleague, Fr. 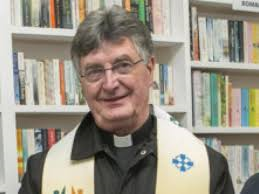 Michael Toomey, joins with me in praying God’s choicest blessings on all visitors to this parish website. Canon Brendan Crowley, Parish Priest.